A week ago, we were on the island of Murano, the island of Venice famous for its glass-making. A thousand shops on the tiny place sold glass ornaments; many of the cheaper ones were selling Chinese-made ones. Trinkets were made in factories in a different world and shipped to this island to sell to tourists to have their piece of Venetian memorabilia. It seemed a strange thing to do. The authentic shops, or the ones trying to seem so, had up signs declaring that there was no Chinese glass to be found in their shop. Overwhelmed yet underwhelmed, we left Murano without having purchased anything but a hot chocolate. Souvenirs must have meant so much more in the nineteenth and twentieth centuries, as the possibility of travel opened up to so many more people, and each traveller was delighted to bring home a piece of the place they visited to remember it forever. But what do souvenirs mean in a globalised world when anything can be bought over the internet? And in our cluttered houses, with too much stuff, where no object can truly be treasured, only drowned out in the noise of our possessions. We packed with no spare room in our bags at all. Our expectation was that we would bring home nothing but photographs, given our dislike of shopping and ideological disdain for souvenirs. Then, on the bus between cities, I was talking to an Australian couple who were collecting shot glasses from each city they visited; they showed me their latest from Lucerne. I said, “That’s going straight to the pool room!”; they laughed, but I’m not sure they got the reference. I was kind of jealous, imagining their cabinet full of slightly kitschy shot glasses to remember forever their great Europe trip. What was I going to have to show for my holiday? Did I really think my memories and photographs were enough? 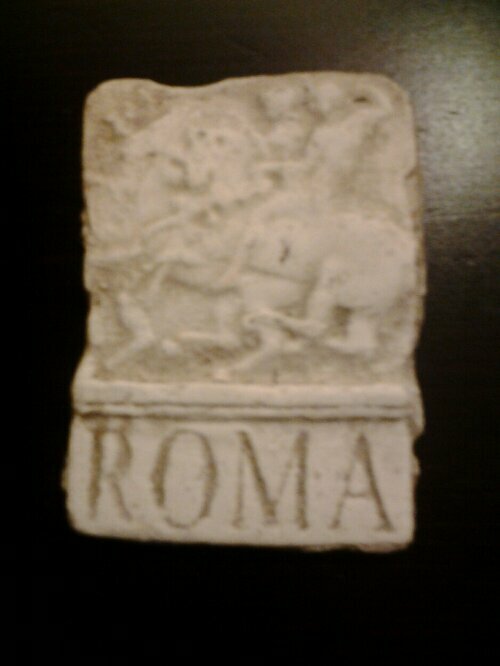 I’d missed four cities already, but next city, I bought a fridge magnet. It would hold up documents on our fridge, and remind me of the exotic places I had been with an iconic image of the place in question. Never mind where it was made. Never mind how tenuous the link between the image and my experience of the city. I decided I would join the souvenir game. I have done this knowing there’s something despicable about souvenir stands. (There’s one every twenty metres in the Vatican, it’s the worst for them.) They remind us we are tourists. They remind us we are a herd. They remind us we trying to capture our moment, capture the place in a trinket, and that, really, we have failed. And still, today, before I left Florence, I made sure I’d got another magnet. This just made me laugh and laugh. It is so true and yet we get so caught up trying to purchase things that will help us remember our experiences – when probably we should be just living the moment. Even taking photo’s can take away from our full enjoyment of the experience if we are not mindful. Please keep on writing about your trip though, really enjoying your thoughts. Thanks Carol! Have to find something else to write. 🙂 Been in a little village away from the internet a few days, but back in civilization for the home stretch. I also avoid most of the manufactured stuff sold as souvenirs to tourists. However, sometimes I think it can be nice to bring back some small tangible reminders of a good trip, in addition to memories and photos. What works for me is to hang on to a few small functional things used on the trip which might have a practical use back home. Like a bookmark printed with the name of the 2nd hand bookshop I bought some holiday reading from. Or a distinctive reusable shopping bag used for grocery shopping while away, or the maps used on a road trip, or sometimes even a fridge magnet! One of my more memorable, though not small, souvenirs was a pair of crutches acquired on a Canadian ski trip that went wrong. They arouse memories of a holiday which was mostly very good, and might even come in handy one day (but I hope not). Thanks for stopping by, Graham. The crutches were an effective souvenir! Even though they’re heavy, I presume they didn’t count toward your baggage limit. It’s one souvenir suggestion not in the guidebooks.